Now that healthcare consumerism is replacing traditional retail storefronts with dental and urgent-care clinics, the sector has drawn ravenous interest from private equity. But a new analysis finds some would-be buyers are getting discouraged by increasingly high prices. 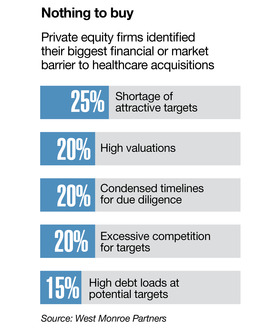 One in 4 respondents to West Monroe Partners' recent survey on 100 private equity groups and strategic healthcare buyers said their top challenge in completing healthcare mergers and acquisitions is a shortage of attractive targets. The biggest reason? They were too expensive. "It's kind of a perfect storm of rising valuations," said Brad Haller, an author of the report and a director in West Monroe's mergers and acquisitions practice. The report found there were 579 deals for U.S. healthcare targets last year, the second-highest total on record, and the median transaction value has increased substantially since 2015. Targets included healthcare providers like physician practices and health systems as well as healthcare IT companies and life sciences companies. Health system deals tend to catch a lot of headlines, but they actually represent a small proportion of overall healthcare M&A, Haller said. Midmarket transactions, especially among relatively small specialty practices, make up most of the deals taking place. The problem is investment banks are overpricing the companies looking to sell, valuing them in some cases two or three points higher than just two years ago, Haller said. "I think there's a sense of frustration that companies that are essentially average in terms of their financial performance or operational capabilities are looking to demand a price that is in line with people operating in the top quartile," he said. The reason prices have risen on the provider side is simply because they're watching their peers selling at premiums, Haller said. Dental groups, for example, are attractive to private equity firms because insurers tend to reimburse them without much pushback, their patients return regularly and their industry is fragmented, inviting firms to create services organizations to support them, he said. "Now private equity firms are looking at what other specialty groups have similar criteria," Haller said, adding that has so far included specialties like dermatology, ophthalmology, plastic surgery and behavioral health. 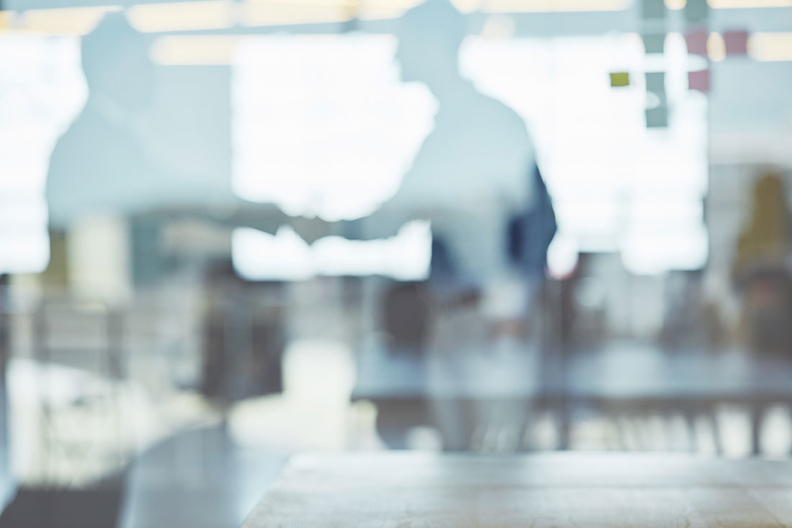 Private equity's strong appetite for healthcare acquisitions was on display in a recent regulatory filing that revealed nine such firms submitted offers to buy Nashville-based physician staffing company Envision Healthcare in February. In June, Envision announced private equity firm KKR would buy the company for $9.9 billion in cash and assumed debt. KKR submitted a bid for up to $46 per share, which came in less than other offers of up to $60 per share. Other important measures of attractiveness the survey respondents highlighted besides affordability were preparedness to respond to regulatory change, adaptability to market trends, strong financial performance and adequate technology to sustain growth. A new report from Ernst & Young similarly noted that a new difficulty for private equity is finding companies with the infrastructure to support growth. Outside of hospitals and health insurers, the healthcare market is highly fragmented, with a number of early stage companies, said Gregg Slager, the report's author and EY's global transaction advisory services leader. "It tends to be one or two dominant players of size and then everything else; there's a significant drop-off in terms of size and sophistication," he said. West Monroe's survey also found that 73% of respondents had walked away from a potential healthcare acquisition. That number seemed high to Haller and his team, so they dug in further and learned that deals had been called off in some cases after extensive due diligence. Would-be acquirers walked away because of anticipated problems with reimbursement, technology integration and security and compliance, he said. EY found an even higher number—78%—of respondents said they had walked away from a potential healthcare deal within the past year. Slager said that's simply because the valuations were too steep. Todd Rudsenske, a managing director with Cain Bros., took a more optimistic view of West Monroe's finding that 1 in 4 respondents had trouble finding attractive healthcare targets: 75% still see attractive targets. That's a figure he said squares with his own experience watching physical therapy, urgent care, dentistry and even veterinary practices become increasingly consumer-facing. "That's bringing more investors into the sector as they see more consumerism in healthcare," he said. "There are more growth opportunities in the community, closer to the patient in more convenient locations." More than three-quarters of West Monroe's respondents said they would definitely or likely seek more joint ventures or alliances over the next 12 to 18 months. Such deals allow firms to divide the cost and dip their toes into a potential acquisition before buying it outright, Haller said. Despite all of private equity's investment in specialty practices, several industry experts said firms haven't shown the same appetite for hospitals and health systems. Brick and mortar assets like hospitals are expensive, and the high degree of consolidation that's already taken place in the sector has made them even more so, West Monroe's Haller said. Plus, buying health systems means improving patient care, paying for building upkeep and adding new technology. "I think they're kind of being scared off," he said. M&A within the health system and hospital sector continued to be strong in the first quarter of 2018. Kaufman Hall counted 50 such deals in the quarter, putting the sector on pace to hit four straight years with more than 100 hospital and health system deals. That said, Anu Singh, a managing director with Kaufman Hall, said he's not surprised private equity firms see more value in companies that are focused on one piece of healthcare's transformation. Health systems typically are slower to adapt to the broad changes sweeping the industry, he said. "Specialty-focused organizations that can more specifically adapt to change either faster or with less effort or less cost are getting more attention by private equity firms," Singh said. "That actually is not a surprising result of what we're seeing in the market."